Bananaman — Oh my zod! The walk sign at the traffic lights was on and some knob turned left and almost hit me with his car. Nice one. In 1983 a new superhero appeared on British television screens. It was a cartoon based on a comic strip which first appeared in the British comic Nutty in 1980, and as everyone British child from the 80s knows, the cartoon was awesome. Whenever I mention it to my Canadian friends, very few of them ever seem to believe that there was a superhero whose secret superpower was (if you'll forgive the pun) utterly bananas. 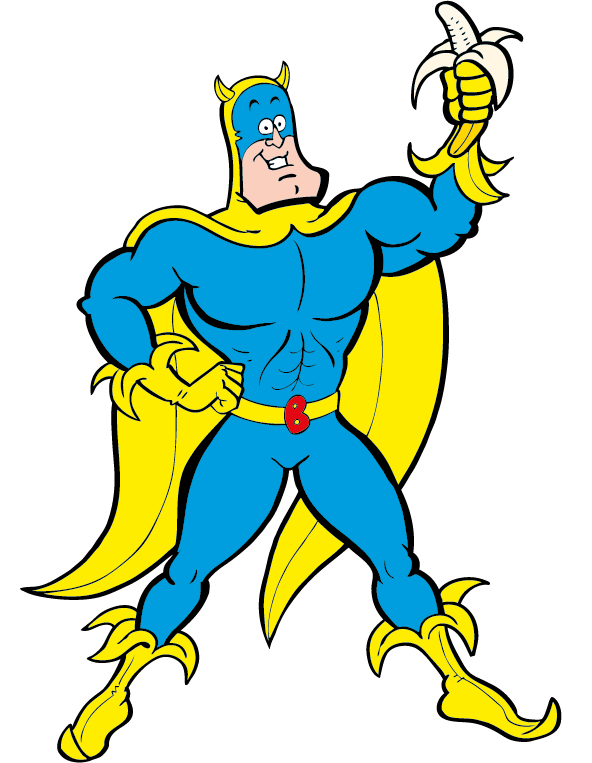 Bananaman is a parody of traditional superheroes, being portrayed by a schoolboy called Eric who transforms into the muscular flying hero known as Bananaman whenever he eats a banana. He looked like Batman, had powers similar to Superman, but was dumber than two short planks - all perfectly good reasons why he was so loved by children. I still remember being totally psyched as a child anytime a new episode of Bananaman appeared on TV. There was just something fun about the idea of becoming a superhero just by eating something completely mundane like a banana. I sadly don't recall ever seeing any toys of the character at the time, and a Google Image Search for "Bananaman toys" mostly reveals results for the far less appropriate "Bad Banana Man" instead. But Bananaman's adventures also continued in two other popular British comics for kids; The Dandy and later The Beano. I always preferred the latter, and still remember the joy of him finally appearing in the comic that I chose to spend my [not particularly] hard-earned pocket money on. Now I will be completely honest; when you remove the legendary rose tinted glasses of nostalgia and look at Bananaman objectively as an adult, one can agree that he is absolutely crap. His costume is ridiculous, his powers even more so, the dialogue in the show is terrible, the episodes are only 5 minutes long, and he's just a complete and utter gimboid! But the biggest problem that I have with the show is that I reluctantly enjoy it. There's just something wonderfully British about the whole thing that for reasons I can't quite fathom I can't help but love. Plus the marvellous Bill Oddie also provided some of the voices, which just makes it even more delightful. At one point there were plans for a movie with a 2015 release date, which was advertised via both a teaser poster and website with the tagline "Peel the power". Sadly the website later disappeared and one can only assume from the lack of any further announcements that the movie was eventually cancelled. But let's be fair, that's probably for the best. * Long legal story short; DC considered Captain Marvel to be a copy of Superman. Marvel ceased publication after copyright infringement suits by DC over the character. DC later acquired the rights to Captain Marvel and published the character for several years with the same name but under the trademark of "Shazam!". Marvel then managed to regain the Captain Marvel trademark and started off a series of separate characters under the name, eventually prompting DC to rename their Captain Marvel to Shazam. Based in Halifax, Nova Scotia, Oh my Zod! is written by British ex-pat Alastair McFly.